You left us for a better place a year ago today. I remember holding you and telling you I love you so much and that it was ok you could go. I wouldn’t be mad at you. I was excited for you. You would get to meet Jesus today. I told you don’t hang on don’t fight for us anymore. There is no reason to. You are tired you fought a great fight and I am proud of you. You enriched my life far more than you will know. Because of you I met people and became friends with someone who loved you as much as I did. 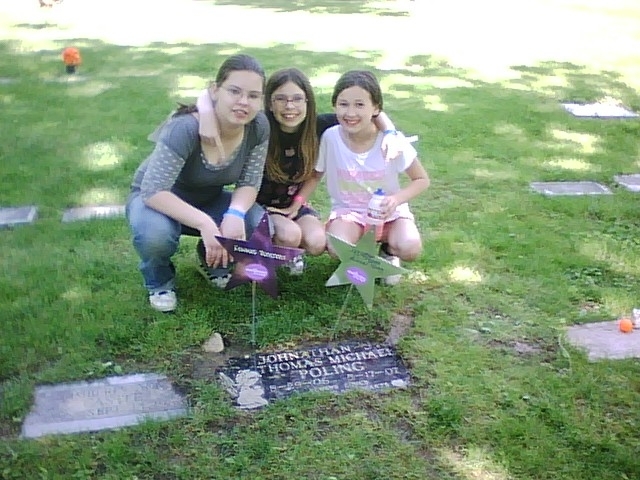 Who fought with you as much as I did and to this day we still love and miss you. I miss so much about you. I sometimes wish I could just have one more moment with you. Where I could tickle your fat rolls and just stare at your face and shower you with kisses. I miss sitting with you and just laying my head on the bed and watching you sleep or the times when you would just play with my fingers. You were so amazed with fingers. After you came out of your heart catherization and I came back to see you that night. I came up to you fighting your vent and you pulled it out you wanted that no more. I can’t blame you. But, as soon as Jenny gave you her fingers you were just content as can be. She only had you that night and you played with her fingers for hours. And she enjoyed every minute of it. We just sat there all night and watched you and played with you and talked and we were just amazed as you were about your amazement with fingers. You was a great son. You were all I ever would have wanted in a son and I got it. I was always amazed at your ability to be so calm and so content even when your body was failing you and you were going through so much. I know that was Jesus, he was walking beside you. He was holding your hand and comforting you and keeping you calm. He was tickling your fat rolls from Heaven to keep you content and happy I just know it. You built up my faith and let me see a loving God who gently walks us through the forest who is there to lift us up when we have no strength left to do it ourselves. And believe me this last year there have been many days where I couldn’t with out his help. When we found out that you wouldn’t make it home with us, I used to think how am I going to live with out you? I don’t think I can. God might as well take me with you because I won’t be able to live with my bubbas. My heart is still broken but, I am managing to put some of the pieces back together. I am beginning to see the blessing in my life that was all made possible because you came into my life and showed me that blessing can come in the smallest packages. It isn’t always the big things. It is the little things. Like being able to get out of bed in the morning with a smile on my face because I know in a few minutes Mikayla will be running to me telling me I awake Mommy, I love you. She has a wonderful way of making me feel so loved. We were watching your video and she said hey that’s my Donthan. I said no, that is my Johnathan. She took my face in her hands and said NO Mommy that is Desus’s Donathan. I said you know what sweety? You my dear are right! You my son, are in Heaven with Jesus. God gave you to me for a short while and back to Heaven you went. But, you will always be on my mind and in my heart. You are my son, you always will be but, you are Jesus’ too. I am so thankful you are being so well taken care of. I Know you are gloriously happy. Worshipping the Lord, dancing on clouds playing amongst the angels and eating chocolate pudding. Free of all the wires and procedures that you were encumbered with in this world. Oh how awesome it must be to be whole and healed like never before. I am thankful and excited for you. So, until we meet again, my sweetness, I will be down here living, living a life that you have taught me that I need to live. No more hiding or running away from life. I will live it to the fullest because that is what you did while you were here. And I can’t see doing it any different than you did. 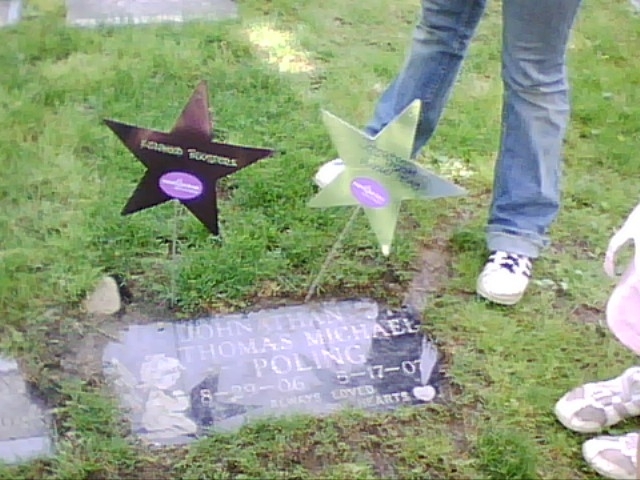 Johnathan Thomas Michael Poling !!!!!!!! Ode to the Kitchen Aid Mixer…. I really want a kitchen aid mixer like really bad right? Well, I do. Can you imagine the possiblilities I could do with that baby? Well, I missed a giveaway yesterday over at pioneerwoman I really love her site. Her site with a few others have taught me how to cook and bake. Plus, her stories are just so entertaining. If you haven’t checked it out yet, you should. But, there is always hope. Hope that my husband will hear my pleas. My pleas to please buy me a kitchen aid. That it would be in the best interest of his tummy if he got me that one thing. My birthday is coming up on the 23rd. So, there is hope. There is always hope. Even if things don’t seem like they are going the way YOU or I think they should. There is always hope. You might need to just look a little deeper and move a few things over and kick something out of the way but, hope is always there. And if it is not for me to have one then it isn’t for me to have one. Which is ok with me because I have all that I need when I need it. Funny how that works out isn’t it? Stacy and I were talking last night and we were talking about needs and wants and so forth. Things you think you need you really don’t because God provides what we need when we need it. Not want it. You know. It may take after the fact for any of us to figure it out but, He provides. While I may think I NEED a kitchen aid mixer, it is just a WANT. I do have a hand held and while it won’t make those stiff peaks for egg whites that I WANT to do. It is ok, because we can do with out that. And a big shout out to the Big Man, who provides for me and blesses me with all that I have each and every day! Thank You!!!!! 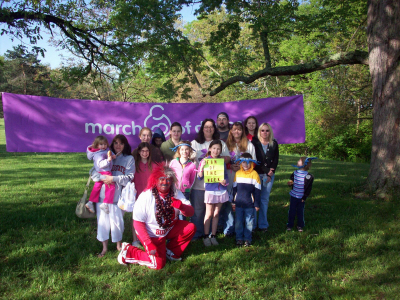 March of Dimes March for Babies. I for some reason totally forgot to update about our March. Sorry about that. I don’t have any pictures yet, but, I hope they will be forth coming soon. We had a really good time. We got there got our little signs on our backs to show we were marching for JT. That he inspires us. Then we made his star and put it in the field of stars. It looked so pretty all the stars just dancing in the wind. They made announcements and kicked everything off. There was a marching band that led everyone, and they shortened the course. It is now 3.5 miles instead of the 6 miles it was. We got back, ate a little, played some games. Got in a water fight, the kids all got their pictures taken on the Harley. I bet you can guess who started that one right? Then we just spent time talking and visiting. It was a bunch of fun and I can’t wait until next year. Oh wait, I do have a couple of pictures. I will put those up in a minute. The OSU Buckeye Man was there and he took pics of all the teams for his website. When we were leaving we grabbed JT’s star and on the way home it was Harley’s idea to put it on his headstone, so, we stopped, did that. Then the girls wanted a photo shoot with my camera phone which I forgot I had by the way or I could have snapped pics at the walk. lol. But, we had a great time and I totally can’t wait until next year. This is our team with the OSU Buckeye Man. Here are his stars. Harley insisted she be in the pic. Even if it was only her feet and legs. Here they are doing their photo op. From left to right Harley, Asha, and Stacey. We had oodles of fun. We went to dance afterwards and by the time the day was over the girls were exhausted. Today is busy busy busy…..
Yikes, I have so much to do. I am slightly dreading it. But, it will be alright. I have to have Ashley at the dentist in a few and she is totally not wanting to go. Then drop her off at school. Then I have to go do a few things for the Granny woman. This will make my life fun. She likes to be difficult. Then I have to go to the girls’ school and do that stuff. then get all the kids home that I pick up and then it is off to Ashley’s choir performance. Then it is home to stay and watch American Idol. I really want David Archuletta to win. He is just so cute. If I could adopt him I would. He doesn’t have a big head and he just blows me away with his singing. I think the David’s are going to be the top two. I know Syesha has stepped up her game but, well, I just don’t know. I think it will be good bye for her this week. This season has been really good. I think this is the best talent that they have ever had and well, I think a few great singers left before they should have but, that is my opinion. Don’t throw stuff at me for it. lol. I don’t know what I am going to watch on tv now. All the show’s that I watch are going to be going off. Big Brother is over, Survivor is over, next American Idol. Which is ok, because for the most part we don’t watch tv in the summer time. Too much stuff to do outdoors and while I would rather be in the Air Conditioning this summer I am going to make an effort to get out and enjoy it more with my children. I think I have found a volley ball net, and we all love to play volley ball so that is something that we can do this summer and I am thinking of having mike get a basketball net also. I love basket ball and so does Stacey. I use to play on a team that got a scholarship to go to the UT (university of Toledo) camp. It was so much fun. We were in Junior High and we all got T-shirts with our numbers and our name on the back. The front said UT and we wore those things every where. We were just so proud of them. We are also getting bikes all of us and we are going to be riding the bicycle trails. We have them around here so why not use them right? Mikayla will probably be spending some time with Granny when we do that one. I really don’t think she is old enough to do that one. This summer we are also going to start painting and fixing up the house. We are doing the outside first so, we are going to redo the porch and make it look nice I really want a concrete porch but, hubby says no, so, we will strip the paint and go with something natural. I really don’t like the blue gray it is. Well, I guess I was telling you more than my day. I also would like to ask for prayers for Jacob he is on my blog roll at the top. He is having a few problems with breathing and eating today. He has Trisomy 18. And he has been with us for 119 days. Which is awesome with a t-18 diagnosis. Check out his blog you will totally fall in love with him. Everyone have a great day and God Bless!!! What a great day this has been…. I woke up and Harley made me Eggs and Bacon. Then Stacey and Asha had made me cards. They attached real flowers. I am scared to ask them where they got them from. Then Page (one of the girls’ friends called and asked specifically for me and said HI Mommy, Happy Mother’s Day, I love you. Everyone let me lay in bed for a long while. This is the first in a long time I didn’t get out of bed before 6 am. We then planted some seeds and are gonna watch them grow. That was fun and dirty but, we loved it. Mikayla gave me a whole bunch of hugs and kisses. I went to see JT and we talked for a while. Well, it was a one sided conversation. I just feel very safe and at home in the cemetary. Ok, that really sounds wrong now that I have written it out. You see, I used to be afraid of the graveyard as we used to call it. I watched that Michael Jackson video Thriller way too much. I was always so afraid something would come up out of there and get me. And this lasted well into my adult life. If we were going past a cemetary in the dark, I would just start praying God don’t let them get me. Seriously, it was terrible. But, a cemetary is really a beautiful calming place. Just like it supposed to be. My fear was like that tree outside your bedroom window that is a great tree in the daylight but, becomes this monster with fangs and claws scratching your window to get in. Until you open your eyes and look, then you really won’t see that it is just a tree same as it always was. Well, eyes are open now. The rest of the day was spent at home planting some flowers and watching a few movies and the finale of Survivor. I really wanted Amanda to win, but, Parvatti did. They both played a good game but, I just think Amanda played with more integrity. Just my opinion folks. lol. It was a bittersweet day and while I was missing my boy, I enjoyed my family and my children that I have here with me so much. I hope everyone that is missing children on this Mother’s Day had a blessed Mother’s Day! I added a page called my bubbas it is pics of JT. I am going to work more on it later. But, just thought you might like to check out what I have so far. Tomorrow I will be marching in the March For Babies. I am really excited about it. But, afraid I will loose my cool. I hope not. 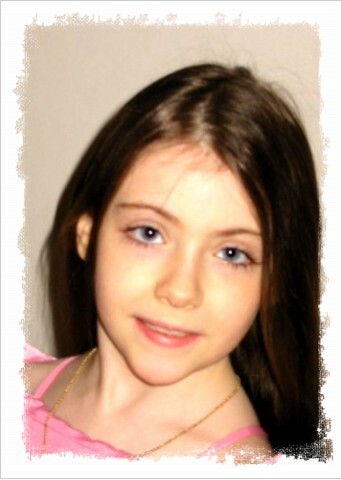 I want to walk for the babies and have a good time but, feelings and emotions sometimes gets in the way. Let’s hope I can participate and just be happy I am making a difference. I have raised over 300.00. Woo hoo for that. Next year I will make a bigger goal and go for that. Thank you all for donating to a great cause. Without your help and support I wouldn’t have gotten this far with this endeavor. I was talking with Lisa who is the head for our district and she wants to me chair a position for next year. It is basically just conference calls twice a month on how to develop fundraisers and to raise money. That is right up my alley. I have been helping with fundraising stuff for years. So, I think I might be able to help out there a little bit. I am actually excited about it. It is nice to be excited about something. Well, I am going to get some more laundry done. Talk with you all later.